This drawn thread work lesson was originally part of a stitchalong sampler released month by month in my newsletter. You can access the other parts of the sampler using the links at the bottom of this page. In drawn thread needlework we actually REMOVE fabric threads and then gather the remaining ones together into decorative bands. 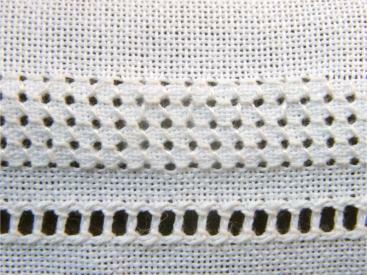 In pulled work, no threads are removed they are just pulled into a new arrangement to give a lacy effect. don't worry about cutting the fabric threads and pulling them out, it won't make everything fall apart! First we will secure the ends of our band with buttonhole stitches. Start by counting down 8 fabric threads from the left, bottom of your first band and mark with a pin. We will remove the ninth to twelfth threads in due course, but first thread up with perle 8 to work the buttonhole stitches. 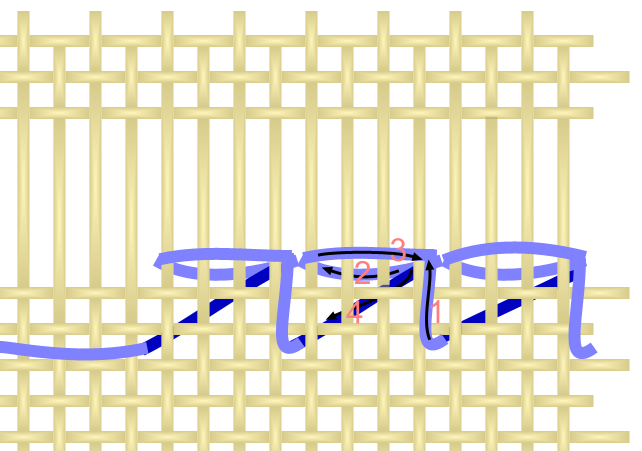 Work five buttonhole stitches vertically, with the corded edge to the centre of your work, directly below the left hand edge of the first band, as shown on the chart below. Then repeat at the right hand side of your sampler. I have drawn these stitches in blue on the chart to make them easier to follow, but you will use the same colour thread as for the rest of your sampler. Once the fabric threads are secured at each end you can start to cut and withdraw them. Snip each of the four threads once, in the centre of the row. Then, using your needle, gently pull them free of the fabric, working back towards each side of your sampler. Once you reach the buttonholed edges you have two options. You can just snip the fabric threads close to the stitches or you can thread them into a needle and run them underneath the buttonhole stitches for extra security. Try to weave them into the fabric itself going over and under the remaining threads right out to the edge of your fabric then cut them. You should be left with vertical fabric threads only throughout your drawn thread work band. The next step is to gather those up into groups of four threads by way of hemstitching. Secure your thread behind the buttonhole stitches ready to hemstitch along the bottom of your band. Following the numbering sequence in the diagram below, bring the needle up two fabric threads below the open space at the right hand side of the row in order to start stitching. Take the needle into the gap (1) and behind the first four vertical fabric threads (2), then bring it back to the front. Take the needle back down where you started (3), forming a wrap around those four threads. Bring it to the front again four threads to the left and two threads down (4).<p> Repeat along the row, pulling firmly to draw the fabric threads into a tight bundle. Repeat this sequence to secure the top edge of your drawn thread work band also, making sure to collect the same four threads together to form the ladder effect, as shown at the top of the page.